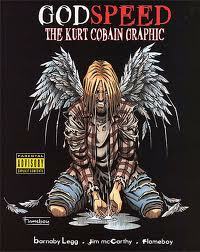 Godspeed: The Kurt Cobain Graphic takes Cobain’s story and plays it out as a totally unique graphic novel. From the luminous colours of an idyllic childhood through the flamboyant hues of success and stardom, Cobain’s story inevitably declines into a much darker palette. In the beginning there is an introduction saying that Godspeed: The Kurt Cobain Graphic starts with suicide and ends in suicide, but don’t think of failure, think of heroism. It tries to make you see it in a positive light, but how can someone when they’re reading about a child who does not see himself with a future? How can you see a positive when you’re reading about a child who sees his end in self inflicted death at such a young age? He hasn’t even lived yet and he is already dreaming of dying. I don’t think failure when I read this, but I also don’t think of happiness. Sure Kurt Cobain made an impact on the music world, but this is not a pretty or happy story. Just because a man was born who made a change and a difference to so many people, does not mean that his story will ever be a happy one so how can I think positively? It’s not as if I don’t know about Kurt Cobain’s short life. I was obsessed with Nirvana myself, had a Cobain t-shirt which I wore to pieces, and have even read plenty of books about him so I don’t expect a pleasant story. None of this story is a surprise to me, but it’s different seeing it visualised and told from such an early age. Images can make such a huge difference when they accompany words and this is one of those cases. In this interpretation music was really his life line, but at the same time it is his death sentence. And it’s interesting how one moment everyone hated the young musicians and then the next they loved them. People think they don’t like change, but really we change our minds so fast that it’s not funny. This is a perfect example of the fickleness of the human mind. I like how the art and panels are set out on some of the pages. There is one page dedicated to Kurt sharing visions of what his future is going to be where he’ll be a rock star and then die. There is a series of panels depicting the band’s rise to fame, a full page of Kurt tripping on acid and crowd surfing, and I really love the page where he discovers as a child how dreams can be an escape and how close they can be to the surface of sleep. There’s a page dedicated to him beginning his heroin addiction which I love (even though I’m against drugs) because it is such a lethal act taking place, but it ends on an embracing note as if the heroin is nurturing him. It’s quite depressing, but shows how he feels he needs it and I guess that’s what those images set out to do. I’m quite impressed with the artist and the writer. I don’t necessarily love the art, but the combination of the art and the words make it quite poignant. I recommend this graphic novel even if you don’t care for Nirvana or reading yet another interpretation about Kurt Cobain’s life, but at the same time I also recommend reading it when in the mood because there are no happy endings in this story and it really makes one reflect on unpleasantness. This looks so sad. I am not a die-hard Cobain fan, but I really enjoyed his Journals. They were so beautiful! Thanks for the review! It was pretty sad, but I still loved it. I didn’t even know he had journals! Oh the things we miss, thanks for mentioning those. I may have to track them down and have a read. I work for a graphic novel publisher called Campfire graphic novels. We produce good quality and informative graphic novels in various regions. I was very impressed by the reviews I read on your website. Just wanted to confirm is their a way of reviewing our graphic novels? Wow, thank you so much for the compliment. I don’t actually review for anyone except for myself, but I’m definitely interested. I’ll send you an email about it shortly. Surprising isn’t it? I saw it on the shelf and had a gob smacked moment. I hope you find it ok and enjoy it when you get it. I think it’s really well done. Haha I think the book store might be a bit of a Casanova.